The world of collaboration is changing and EMC is making dramatic moves to address the portfolio’s relevance in the market. All of the legacy ECM vendors are struggling to maintain or redefine themselves in this space. There is no debating the fact that SharePoint was a tremendously disruptive product in the collaboration market and redefinition is essential to survival. SharePoint however should no longer be thought of as the contender or disruptor. It has become the standard. The victory though may be short-lived. SharePoint is now the technology that must be disrupted to move the market forward and EMC with partners Cisco and Box is challenging the status quo. Last week we saw two key announcements around collaboration and the EMC IIG suite. The first is proposed integration of EMC Documentum to Cisco-Quad that will eventually expand the capabilities of that platform with enterprise content management features. Content management has a clear and compelling role to play in Cisco’s vision of enterprise social interactions. The second announcement is for the development of an integration delivering Documentum content though the Box cloud solution. While the Cisco deal is fairly straight forward I admit I am struggling to get a handle on the possibilities of Box and Documentum coexistence. It is difficult to reconcile my training and background in controlled document management to the “free range” content world served by Box today. I suspect I am not alone. In thinking through scenarios I keep landing on a key difference in the approach of the two product lines that needs to be well understood before embarking on any meaningful integration. When I log into Box the focus of the interface is “All Files.” The content layout and organizational root is the user’s personal view. Documentum has the concept of a home cabinet and a construct representing My Files but this is completely optional. Documentum’s core organizational paradigm is completely independent of any given user. This difference in perspective leads me to characterize Box as something I am starting to call Employee Managed Content as opposed to Enterprise Content Management as delivered by Documentum. This is more than a semantic preference. It permeates the user experience within Box. Managing content from a central corporate structure, organizationally and technically is the mainstay of ECM. As products like Documentum have attempted to expand the core of managed content beyond regulated material they have faced resistance in the form of poor adoption and cost justification challenges. The qualities of the larger body of essentially rule-less employee controlled content similarly press the desire for unfettered access and are thwarted by complexity and excessive implementation costs. The barriers have led many to conclude that there is no reason to manage much of it at all. SharePoint was able to expand the sphere of managed content beyond more functional repositories because of the perception that users were more in control of the experience and rules than they actually are. The reality of complexity in implementation however quickly stall and sharing outside the enterprise with SharePoint in as free a manner as most desire remains out of reach. 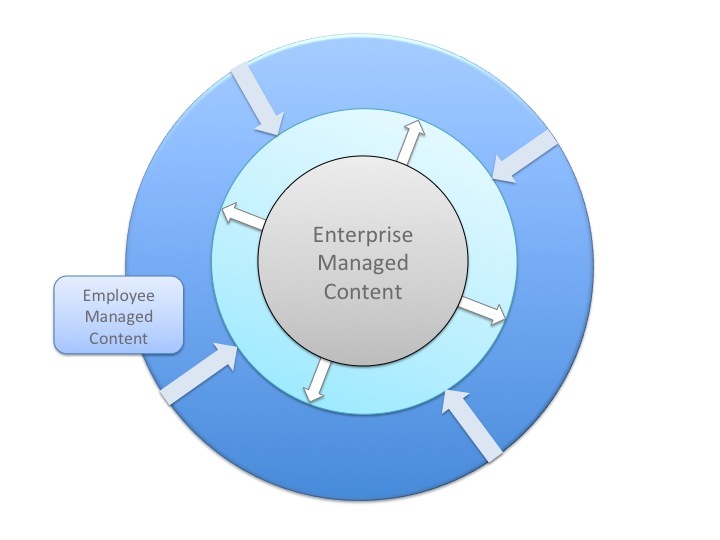 The combination of a tightly controlled, process and records content managed by Documentum and loosely managed sharing expands the scope of coverage of the unstructured data ecosystem in the enterprise in a manner that is difficult if not impossible to achieve with a monolithic or even an integrated SharePoint approach. The content replication bridge provided by the Box/Entropysoft Connect offering is a good beginning to let content traverse the feature gap of the two worlds some processes demand. It is clear however that a tighter coupling will have to be developed for the full potential to be realized. In later posts I will share some of my recent experience with the Box API and simpler ways that Documentum xCP and Box can be leveraged today in a process oriented environment. With or without the benefit of a more productized integration. Times are changing and we have to move faster. The market, customer business priorities and technical advancements require that we move faster to solve for the explosion of unmanaged content in the enterprise. This combination is just one of the ways that EMC is making the journey to the cloud possible and realize it sooner than we might have done on our own. Disclaimer : As always, this post is my opinion and does not necessarily represent the opinions of my employer (EMC) or the partners mentioned. Very good article as always. Wish you had not started framing this a race to the bottom. Who are the users, what are the use cases? What is the business prop? Going to play dumb for a minute and go back to the dual issues of collaboration vs. control. 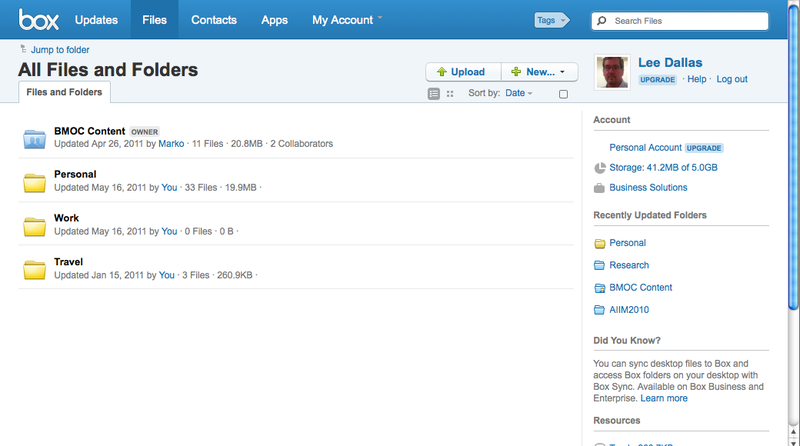 Why does this seem like an Enterprise version of Dropbox? User empowerment at this level also creates other issues for the Enterprise. One such quick question – how does this play with Data Loss Prevention and Discovery, two Enterprise IRM hot topics? Or is this solution an attempt to create a commodity service to the mid-size market or non-MS market where an embedded Sharepoint is not so much of a concern? If so, this sort of smacks of a marketing shift for EMC from the Enterprise back towards the mid-tier market. Don’t get me wrong, content as a service is not only the future, but it really becoming the reality today. Just that the market is crowded and no clear paradigm or standard has emerged. I think ultimately Box.net and others like it are going to prove more of a hit than miss and the next generation will be quite interesting. Even so, I can never count MS out, No matter what, you can bet MS will ensure there will be lots of FUD spread around about alternative solutions to make people want to face the numerous hurdles of taking Sharepoint external. great comment Worthy – I guess I started out with a the “race to the bottom” set up because that is a little what it feels like – but in thinking through the topic it is more than that. categorizing box as enterprise dropbox I don’t think is an unfair comparison. I also don’t think box would disagree. dropbox is very much focused on the consumer market and doesn’t want to bother with corporate red tape – this creates whitespace for box to fill. As to why can’t you fill it with Dctm – again IMHO a fair question – I could given enough time, $ etc but at the end of the day I don’t think that the ROI is sufficiently provable except across very diverse use cases, owned by disparate departments that find it difficult if not impossible to cooperate and work with IT to deliver. I no longer agree that opening something like box to the enterprise creates an issue that does not already exist. People are going to share files. They have to in order to get their job done. The question is do we want to be a part of the solution or stand by and watch as they solve it through a hundred one off agreements paid for with a credit card. There are so many use cases that trying to solve for all of them quickly with any on-premise legacy ECM product or implementation becomes impractical. Sharepoint did a number on ECM by absorbing the internal workgroup file sharing use case. This did not however solve for the external sharing need without the same problems that traditional ECM faced. As I argue above- the farther one gets away from the managed core the simpler the requirements get. At a certain point it becomes more practical to just solve for simple file and data sharing and avoid the complexities of site/page management. Consequently a repository (any repository) already in the cloud can politically and logistically overcome objections to adoption by all parties easier than the IT budgeting, validation, design, build, release and support process can. Sharepoint included. I don’t count MS out – I just believe there is a huge amount of totally unmanaged content that even SharePoint is overkill for. From an EMC perspective it is probably better to acknowledge that market potential and pursue it and through the partnership provide tools to extend the box story to support DLP, IRM, and RM as certain casual content evolves to a managed state.